Two months before he died my father took my sister and me to the beach, and that’s the glimpse I hold of him – sitting on the towel with his knees to his chest, looking past us to the horizon. It was years ago, and I was a young girl; he was a man, nearing what should have been the middle of his life. He remains in my memory the way he looked that day: sunburned, windblown, distant; squinting at the ocean, the edges of his mouth turned down, his eyes two slits – the way they would look later, in the hospital, when he lay choking on a respirator tube. I don’t like to think of him as that man on the hospital gurney; that was not my father. I remember instead the glistening sunbathers, the stink of the low-tide creek, the mournful gulls, the hissing sand. I remember my father as he was, sitting on the sand, though I couldn’t imagine then that a day would come when I would no longer be able to see him. I remember his body, the drops beaded across his pale belly, the dark hair plastered in web-trails across his chest, how he tousled his gray head with a towel; how he leaned over me, close and warm, to pat smooth an overturned pail of sand. We shrieked with laughter when he tossed us into the waves, the chill water that stung our eyes and left our bodies gritty with salt. Afterward we wrapped ourselves in towels and walked to the concession stand, where he bought us red and blue slushes in paper cones. At the end of the day, when the sun was low, he packed up our sun-lotion and sandwich wrappers and told us it was time to go. But I was never ready to leave; I didn’t want the day to end. So I ran, laughing, a tall shadow across the sand, and plunged into the cold water, taunting him to come and pull me out, to drag me home. I believed I would be able, always, to grasp his strong hand just as a wave came plummeting down on us. I can still see him there, blurry above the water-line, a distant golden figure coming closer; I can see what he meant when he promised that even without his arm under my belly to hold me, I could stay afloat. Hank Feldman looks nothing like my father. Daddy was a tall man with dark eyes and broad shoulders who never got old. Hank is tiny, at least 70, hunched and wrinkled. His eyes are a vacant, wintry blue. He sits quietly in the window seat as I shove my duffel into the overhead and collapse into my place on the aisle. He waits a few moments, until I fasten my seatbelt, lean my head back and close my eyes, before tapping my shoulder. I am tired, but agree to give Hank my seat when he explains he will need to rise repeatedly to use the restroom during our two-hour flight from Chicago to Boston. I like to be near the window, anyway, to look down on clouds. “Coming,” I reply, resigning myself to a few moments of small talk. “Coming home.” I will tell him I live in Boston, that I am a piano teacher, that I grew up on the north shore of Massachusetts. I will not tell him this was my first visit to Chicago, or that the so-called specialists at the hospital there can’t help me. During the safety demonstration Hank watches, alert and interested, as the flight attendants explain how to breathe, how to float, how to escape in case the plane should catch fire or plummet from the sky. I look out the window to the paved runway, where men in brightly colored jumpsuits are scurrying about, as if searching for something. I am half-listening, thinking instead about the oncologist I’d met the day before, the experimental treatments, waiting lists, the unpredictable nature of what lay ahead. Out the window the ground spirals away from us, dissolving into atmosphere. I close my eyes, in awe of this technology, of the miracle that carries me 30,000 feet into the sky; of the measurements these pilots make, using instruments of time and wind. I wake to lights below; they blur and waver as though I’m peering through the glass at the iridescence on a sea floor. Hank shuffles down the aisle, and returns to his seat beside me. The lights in the cabin shut off, then, and a bodiless voice intones, Ladies and gentlemen, we’ve begun our final descent. I turn to the window and feel myself floating, submerged in a futuristic womb, staring not into the sockets of my eyeless reflection but out to the night silence. The plane circles Boston Harbor where a peninsula juts like a crooked finger. Around it the blackness of the harbor joins the blackness of the sky, and I try to imagine Hank and I are adrift in space, ageless and untouchable. But Earth ascends; the world comes back to us. Now I can make out illuminated stadiums, lawns lined with streetlamps, freeways of white headlights streaming in one direction, red taillights in the other. As the plane lowers billboards and office buildings glow into focus. Hank says it’s nothing like when he landed in the cornfields of Waukegan Illinois, where two rows of light were the only thing marking the solitary runway from surrounding darkness. It was like landing in a jungle, or an African plain, he says; some wild, undiscovered country. Even now, as an old man, he feels the same slight tensing of his muscles, the same inner steadying of himself, as if he grips the yoke in his own age-mottled hands and prepares to touch down. You’re taught where to focus when you land, he says; to look ahead at the horizon and the end of the runway, rather than down at the ground. I have spent my recent life afraid to think of what is coming; able only to glance back, occasionally, at the receding landscape of places I’ve been. I wonder if my father can still see me; if he would even recognize me now. It seems a lifetime has passed since I knew him. But maybe that’s better. I like to think he remembers me as the child, sun-warmed and laughing, who learned how to swim at Good Harbor Beach. Now I press my forehead to the glass, watching the pavement below whiz past like a gray river, and my breath catches in anticipation. “This is it,” Hank says. Reaching for the armrest between us, he accidentally touches my arm, and for a moment I feel his fingers cold against my skin. We sit watching, waiting, knowing at any moment we’ll feel the lurch and rumble of the plane’s wheels touching ground—that always surprising jolt of reconnection. Meaghan Mulholland’s writing has appeared in The Colorado Review and Southwest Airlines’ Spirit Magazine, among other publications, and her writing awards include a Fulbright Fellowship to Italy. She worked for several years at National Geographic and is currently hard at work on a novel set in Sicily while completing her MFA in Fiction at the University of Arkansas. 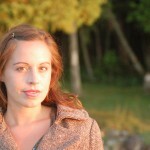 To learn more about Meaghan’s writing, visit her website at meaghanmulholland.com. This entry was posted on Monday, January 25th, 2010 at 8:15 pm	and is filed under Fiction. You can follow any responses to this entry through the RSS 2.0 feed.